Florida International University (FIU) is pursuing commercial partners interested in developing In-Vial Microextraction Systems. These microextraction devices drastically reduce the number of steps, time, cost, and organic solvent consumption involved in the contemporary sample preparation practice. Sample preparation is an integral and perhaps the most important step in chemical analysis. However, current techniques employed for preparing samples are multi-step, laborious, expensive, and often unreliable. Therefore, a need remains for solvent free or solvent minimized microextraction devices that permit the acquisition of low concentrations of analytes present in a wide range of aqueous or other liquid environments. FIU inventors have developed in-vial microextraction (IVME) method and IVME devices that are sample collection vials. These vials have a sorbent coating on at least a portion of the inner surface of the vial, and a sorbent coating of the same of different composition on at least a portion of the outer surface of the vial. 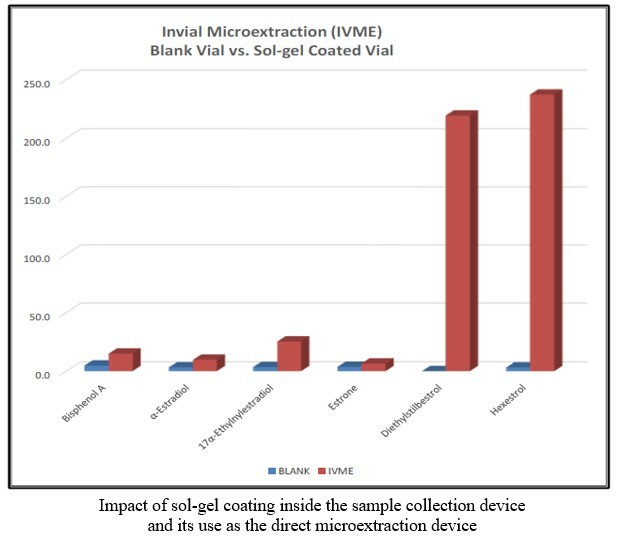 The sorbent coating are constructed on the surface of the vial using sol-gel coating technology, and comprise metal oxide comprising gels that are capable of absorbing at least one target analyte. These vials can be of different size, shape, and construction materials. Sample preparation for a wide variety of analytes in various fields such as biological, environmental, clinical, toxicological, food, pharmaceutical, bio-analytical, and forensic.